Learn how to craft a compelling business case around your idea and develop the financial foundation to gain project approval. Then discover the techniques to garner support and participation within your organization. As risk, compliance, internal audit and IT security executives, we are skilled at the art and science of risk management. However, making the business case must balance those facts with the art and science of persuasion. 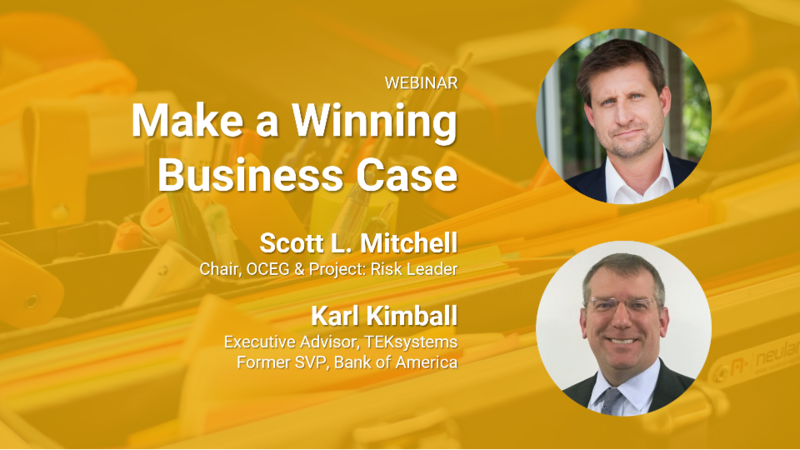 Join Scott Mitchell, chairman of OCEG and the Risk Leader Advisory Board; and Karl Kimball, former SVP at Bank of America and current Executive Advisor at TEKsystems as they walk through step-by-step model to make a flawless business case for your risk-based work. All the guidance, language and templates you need to transform departmental risk tactics into an enterprise risk discipline are here. Understand how to create a Conceptual Model that can be vocalized to your future audience before you spend more time digging into the details. Understand how to create an Analytical Model that analyzes various options and allows you to select one to present. Understand how to create a Pitch Model for your business case that gets approved. Registration information for this webinar was sent to . Make sure the email arrives in your inbox: either add "support@projectriskleader.com" as a safe sender to your email platform, or if you use Gmail, drag our email into your Primary tab.